We don't have any trains in the town where we live, so Hunter was always super excited to visit NC and see the trains. So we decided to take him to the park up there where they have a train to ride. He was so excited! I loved seeing his face light up when he realized he was going to ride the train. He was so happy, but too scared to get his picture taken on the engine with Adam. As soon as he got off he wanted to ride again. Instead, we took the kids over to play on the playground. Yep, he's almost always barefoot! My wild youngin is not afraid of falling, he will climb anything! Mitchell and Justin had a great time too. These are the cutest photos Nancy! Looks like they had a great time. Oh I just love that face. Nice pictures. My youngest absolutely loves trains and we found out our local mall has one that runs around the bottom floor for a nominal fee. :) But it was worth it. Hope the move has been going well. Love that smiling face ! Glad they had a great time at the park. Oh you can tell by his sweet little face he had a super time!! I don't blame him! I would love that my own self. He is such a cutie pie. Those train benches are too cool! Hey! 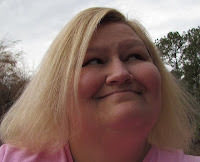 Just came over from MommieDaze and wanted to let you know that I lurve your blog!! Can't wait to read more! !